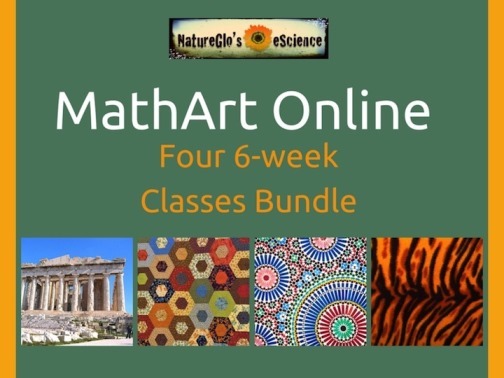 One of the best parts of being a Homeschool Review Crew member is trying out products I've never heard of before, like the MathArt Online 4-Class Bundle by NatureGlo's eScience. This bundle features 4 classes that stream online and feature printable activities over the course of 6 weeks for each class. We found these classes to feature science and math in a totally different way, involving the world around us. For this review, we received access to the bundle classes for one year. These courses, like I said above, are very unique and unlike any other math course we've tried before. I want to say it's more applied, but that's not quite right, either. We focused on the course titled Math Connections in the Real World. This class brings together everything from ancient history to art, and shows how math ties it all together. It took me FOREVER to realize I had to mark things complete. So Mr. B, bless his heart, kept doing lesson one over...and over...and over because it never looked complete to him. Maybe it's just us? I really have no idea. But once I figured that out, I had a bit of a difficult time getting him to proceed through the rest. Autism for ya...he thought he would have to repeat EVERYTHING like that. Whew, once I showed him for the umpteenth time that it was MY fault it did that, he was good to go. A bit of warning: I was hoping if I clicked "mark complete" at the end of the lesson, it would just complete the whole thing and change the overall percentage at the top. Learn from my mistake special needs homeschooling people! It doesn't HAHA! So if that is a trigger for your child, don't do what I did lol! Ok, so after we (Ok, ok...after "I") figured out what I was doing wrong, it was smooth sailing after that. We usually have a 4 day week, and we take Friday as a make up day, extra curricular day, or life lesson day. There are 4 lessons, and a quiz for each lesson in the course we chose. so we did 1 lesson each day, and on the last day we did the lesson and a quiz. some lessons actually lasted a little longer than a week for us because Mr. B wanted to take more time to explore more than what the lesson covered, which was just fine with me. Section 4 actually has 8 lesson links in it, so we took almost two weeks to finish that one. So while I jumped ahead and looked through the last week of lessons, he's just now finishing up lesson 4. Most typical kids will be able to do the whole thing in 6 weeks, but he needed a bit more time than that. I figure we will finish up in the next week and a half or so. Well, I say we will finish up in the next 10 days. But honestly, he's so into the Great Pyramids now after Lesson 4, we may have to take a detour for a week to study pyramids. I gotta say, I was pretty amazed by the first couple of lessons hearing about Da Vinci and the Fibonacci number, but I was truly fascinated by Lesson 4. The Great Pyramids are amazing anyway, but seriously...I was just amazed. The questions in the study guide are really great for your child to use as they watch the video, or to complete afterwards to see how much they retained from the video. One of Mr. B's favorite parts of this course are the fun activities. Some are hands on, some are online like this fun game from Lesson 4. I personally love a course that integrates more than just one subject. This weaves together so much more than just math or science. I mean look at this game? Is it Science? Is it Geography? Is it History? Math? It's all of the above, and a lot of fun, too! 0. Along the way, your student earns reward certificates here and there. Those are pretty good motivators for them to continue onward. Overall, I wish I had been able to get the hang of the web page a little sooner, and I wish it was a little more autism friendly in terms of layout and use. The course itself is pretty fantastic, and we both really like it. I love how this particular course shows the importance and wonder of the Golden Ratio, and how it applies to the world around us, and how math has impacted history. I took the time to go through Mathematics in the Arts & Sciences, too, and I can't wait for Mr. B to start that one. I may do Lesson 3, Celtic MathArt, myself since we have a lot of Celtic Heritage. Math in Ancient Cultures also looks pretty awesome. It looks like we're going to be learning a lot of folklore and music goodies there. Does NatureGlo's eScience Pass My 4 Ingredient Test? 1.) Customization: Is it easily adaptable? Can we customize it to fit “us?” Can we modify or set our own schedule? Can we take breaks, jump ahead, or flat out skip? You are within the limitations of your subscription, but you can move about the courses and lessons as you please. I always advise working in order for obvious reasons. You can pause the videos, and work at your own pace. Just remember, you do have the time constraints of the subscription. 2.) Value: Is it long lasting? Will it cover multiple grade ranges? Are you locked in to one specific grade level? Are there hidden fees? There are no hidden fees, but some projects may require some materials like an Apple if you want to reproduce them. This is good for multiple ages. I'd say a good, solid middle school age to even adult. I don't think younger kids would "get it." 3.) Attention span: Is it boring? Is it engaging? Is it varied enough for ADHD? Does it last too long? It's NOT boring. Mr. B LOVES it. The only non-special needs friendly aspect is the overall layout and design. If that could be reworked in a more visually appealing way for autism, it's be fantastic. 4.) Does it tie into other things we already have. YES! This is NOT just a math or science course. It's like a unit study of sorts for each different course, even each different lesson with in the course. There's history, math, science, literature, art, and even music. It's truly integrated! Several members of The Homeschool Review Crew reviewed this topic, and others. Please click the banner below to read their reviews!